The entire northern coast of Crete is quite even and often sandy, and for this reason it has frequently served as a landing point for both visitors and conquerors throughout the ages. 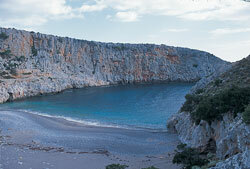 The coastline from Hania to Kolimvari has been especially attractive to invaders. This is where the Turkish army landed in 1645 (and based on this area it went on to conquer almost the entire island which it kept under its rule for 250 years). On this very same place a Greek army force landed in 1897, marking the beginning of the Greek-Turkish war that led to the liberation of the island from the Turks and its subsequent union with Greece. This is also where in May of 1941 the terrible battle of Maleme took place after the sky started raining German parachutists determined to set foot on the island. Both sides suffered heavy casualties in this battle and the land was filled with corpses of Germans and allies - Brits, Australians and New Zealanders - lying side by side. Today another huge invasion takes place every summer, as tourists “storm” the hotels, the taverns and the scarce sandy beaches of the area, causing a frightful strain. This lasts all the way to Kolimvari, so travel these twenty-four kilometres carefully and without stopping, and as soon as you have passed the village turn to the north to enter the Rodopos peninsula. From here on your trip will become more pleasant. The roughness of the Rodopos peninsula is visible from a great distance. A bare brown rock with steep shores, without water, without trees, without even land for cultivation, it has never been inhabited - and will never be inhabited - because it cannot sustain life. On the other hand, since the early antiquity, the isolation and the magnificent wilderness of the landscape were the ideal environment for worshipping the gods. Extra Pure Oil” (it comes in a handy glass bottle of 500 ml, which does not leak and is highly recommendable). Until 1960, these villages were completely cut off from the world - the mule was the only means of transportation - but today they can all be reached by an A3 road. Afrata has two kafenia, which also serve a quick meal. Astratigos, Aspra Nera and Ravdoucha are small, poor villages with stone-built houses and elderly Cretans with the traditional black headband. As for Rodopos, it is the largest village in the area. It has a bakery, a grocery store and a butcher shop, so before you explore the peninsula you can stop and do your shopping. Rodopos is also the starting point of a country road (D3), which was recently built on the track of an old path. This road takes you to the northeastern end of the peninsula, exactly before cape Spatha, where there is a small bay, Menies, with a magnificent sandy beach. 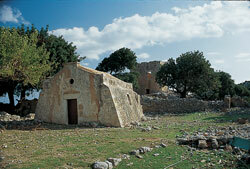 This was the location of the temple dedicated to the Cretan Goddess Diktynna. Diktynna was an ancient Cretan Goddess who had a lot in common with Artemis. She was the goddess of hunting and was young, beautiful and a virgin by conviction. For this they had given her the name Vritomartis, which means “sweet virgin.” She was worshipped all over Crete but especially in the western part of it where most of her sanctuaries were located. The most famous and wealthiest one was Diktynnaion of Rodopos, where during the Hellenistic and Roman period worshippers kept coming with rich offerings from all over Greece as well as from other parts of the Mediterranean. Custom required them to arrive barefoot, in order to be in direct contact with the earth and the nature which the Goddess personified. During the dark ages following the collapse of the Roman Empire the sanctuary was abandoned and looted, but the foundations of a temple and a sacrificial altar, both dating from the reign of Hadrian, remain intact. In the valley west of the temple, close to the sea, there are more ruins, including those of a Roman aqueduct which probably provided the priests and visitors with water. Also, a few ruins of older temples can be seen, dating from the 7th and 6th century BC. Today the area has been deserted and there are only some ruins of recent buildings to be seen. The only building that remains intact is a small chapel, built by the local fishermen who come here to find shelter from the storm or to rest before pulling their nets. In August many tourists arrive, either by boat from Hania or with rented cars or bikes, but in May, June, September and October, the area is a true paradise. You will have at your disposal a wonderful sandy beach, an almost unexplored archaeological site, a solitary place for long walks and all the tranquillity you could hope for. Among the ruins there are plenty of pine and cedar trees offering a welcome shade, and the patches of thick grass growing around them make ideal spots for camping. You will also find lots of wood on the beach for your camp fire, and a well, close to the chapel, which can provide you with fresh water for your shower. It might be better not to drink from it, though, as it is not certain that it’s potable. About three kilometres before the Menies bay a small country road will lead you to the ruins of a monastery of the ninth century. 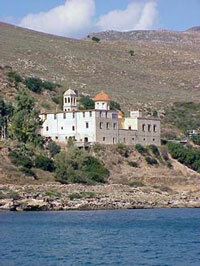 The parts of it that have survived to this day are the church, dedicated to Aghios Georgios, and a few cells. In the only cell that has a roof, a goat herder has set up his household and his few goats animate this barren landscape. There is also an impressive tower, the remnant of the strong fortification the monastery needed to defend itself from the frequent attacks of pirates who terrorised the region. It seems that after some time the monks, tired of fighting rather than praying, decided to transfer their monastery from the lion’s mouth to a safer place. Acting on this decision, one beautiful morning in 1618, they packed their belongings and left to set up a new monastery at the south end of the peninsula. In this endeavour they were prompted by Osios Vlasios, who came to live with them somewhere around the beginning of the 17th century. One night, the story has it, as Osios Vlasios was praying, he saw a vision of the Holy Mary, who led him to the place where she wanted a monastery built in her honour. It was this vision that gave the monastery its name, Moni Panagias Odigitrias, as it was Panagia Odigitria - the Guiding Mary - that dictated where it should be built. Construction started in 1618 and finished in 1634, as the sign on the church dome informs us. The monastery then grew rapidly, acquiring some very large estates that gave it substantial wealth. It was exquisitely decorated with paintings of saints and had a rich library. Yet, once again, the monks found themselves in grave danger: on the 13th of June, 1645, fifty thousand terrifying Turks landed a few yards from the monastery, starting a fierce attack that resulted in the occupation of Crete. The scenes that followed are too horrible to describe. 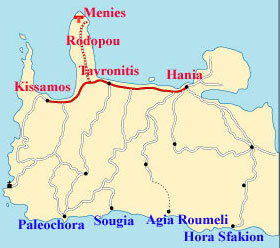 From that time and until the liberation of the island in 1897, Moni Odigitrias Gonias suffered endless raids, cannon shots, massacres, and fires. (In one of these, in 1867, the whole library was burned down and thousands of rare books and manuscripts were turned to ashes). Each time, though, the monks had the good sense to hide as many treasures as they could, and with their faith and endurance they kept the monastery alive. Today, in the church of the monastery and in the small museum (closed from 12:30 to 4:00 p.m.) you can admire many of these treasures that have survived, among them priceless post-Byzantine icons such as The Crucifixion (painted by Konstantinos Palaiokapas in 1638), the icons of St. Nicholas (Palaiokapas, 1637) and St. Anthony(1772), The Assumption of the Virgin Mary (1728), and the triptych “Last Supper - Birth - This is the Man” (painted by Dimitrios Sgouros in 1622). You can also see a few manuscripts, early printings of books, silver vessels and pontificals and, most important of all, an invaluable tomb stele of the 3rd century BC, originating from the ancient Diktynnaion. It bears a relief representation of Efploia Aphrodite with a ship and Diktynna - Vritomartis with a Cretan wild goat. Approximately five kilometres north of Rodopos a country road (D3) goes west and a sign (Gr) directs you to the chapel of Aghios Ioannis Gionas. This is where every year, on August the 29th, a grand three-day festival takes place gathering hundreds of people from the nearby villages. During the rest of the year, though, the area is secluded - only a few shepherds bring their flocks to graze - and you can camp during the night in the chapel’s yard. The road continues for another two kilometres to the south (D4) and stops three hundred metres before the isolated Aghios Petros chapel. The entire west coast of the peninsula is nothing but steep rocks. 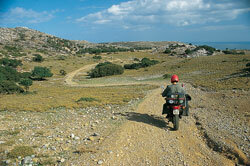 If you now continue westward (from Kolimvari to Kasteli) there are two roads to choose from. If you prefer to enjoy a speedy ride choose the National Road (A1/15km), which has good asphalt and the right inclinations. But if you are looking for a more interesting ride you’d better choose the old road (A3/20km), which winds up and down the hill sides, passing through huge olive groves and hamlets with stone-built houses. Be careful, though, because the road is very narrow and slippery and has many dangerous turns. At one of these turns, at the western exit of Plakalona, you will have a wonderful view of the entire Kissamos Gulf and the peninsula of Gramvoussa. If you happen to pass by at sunset, the view will be an unforgettable experience.